Arriving this Wednesday at Sports Cards Plus is 2017 Bowman High Tek Baseball with 4 Autographs and 1 Base Card in each box. 2017 Bowman High Tek Baseball is a prospect-driven product. That comes through in the base set. All cards are done on acetate with foil patterns in the background. Standard to Tek, which has its roots in the wild times of the late 1990s, the background patterns come in a variety of forms. The aim for this is to aim largely at player and team collectors, offering something more challenging to chase rather than a more standard parallel color rainbow. And if the product stays true to the past few Topps High Tek releases, these patterns will have a tiered structure making for some tough short prints. While the pattern variations offer a different spin on parallels, there are more standard ones as well. Green Rainbow, Gold Rainbow (/50), Orange Magma Diffractor (/25), Red Orbit, Black Rainbow (1/1) and Black Galactic Diffractor (1/1) are the ones to look for. High Tek Autographs are essentially parallels of unsigned base cards. They carry the same general design as well as on-card signatures. A detailed checklist hasn’t been announced, Topps promises the signers will be a mix of prospects and young players who have made the jump to the bigs. Parallels come in several levels, all of which are serial numbered: Tidal Diffractor, Green Rainbow, Gold Rainbow, Orange Magma Diffractor (/25), Red Orbit Diffractor (/5), Black Rainbow (1/1) and Black Galactic Diffractor (1/1). 2017 Bowman High Tek Baseball isn’t just base cards, pattern variations and autographs. There are other inserts as well. 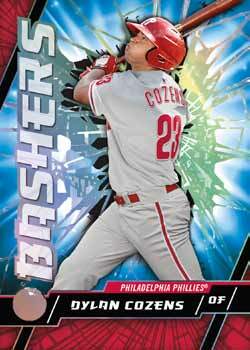 Bashers comes with a bold look that would fit right in with other late 1990s cards if it weren’t for the players. The spotlight here is on young power hitters at both the MiLB and MLB levels. A couple of regular Bowman sets get an acetate overhaul with a pair of additional inserts. 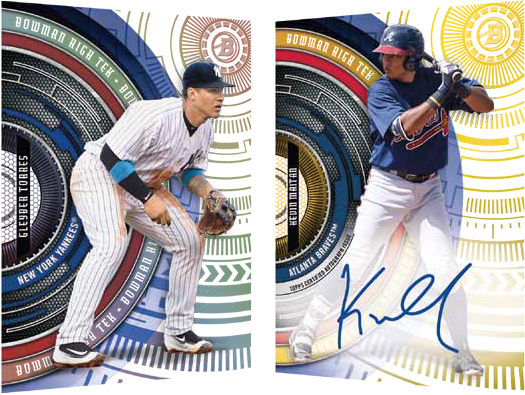 2017 Bowman Rookie Cards featuring Tek-inspired versions of ten first-year standouts. 1992 Bowman Variations are a case hit. The general design is inspired by the classic set that’s celebrating its 25th anniversary. Select cards for each of the insert sets have autographed versions as well.